During tulip season, you may take a Guided Optional Excursion to Keukenhof gardens—with more than seven million tulips, daffodils, and hyacinths, as well as other bulbs, planted each year. Outside of tulip season, join a Guided Optional Excursion to Zaanse Schans to see historic windmills and charming Dutch houses. CLASSIC Join a Guided Sightseeing Tour of the picturesque old-town, fortress citadel, and medieval architecture. Take free time to stroll along Namur’s cobblestone lanes and visit its charming cafés and bookshops. This evening, enjoy live entertainment on board your ship. CLASSIC Join a Guided Sightseeing Tour of the “Fiery City” of Liège with its beautiful ancient quarters, peculiar alleys, and romantic streets. Don’t miss sampling authentically sweet Liège Waffles. 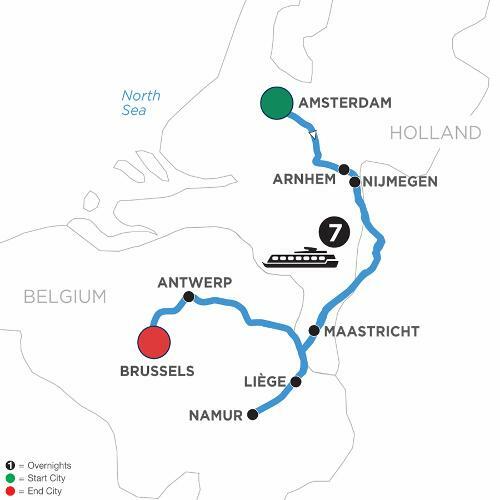 Enjoy cocktail or coffee aboard your ship as you sail to Brussels this afternoon. Later, enjoy dinner and live entertainment. CLASSIC Join a Guided Tour of Brussels, see the Town Hall with its landmark buildings and discover the many local bars, cafés and shops of the Lower Town Streets. If you’ve dreamed of a view filled with windmills and blooming fields of color in Holland and Belgium, it all comes true on your European river cruise from Amsterdam to Brussels! Cruise on the Rhine River with a visit to Arnhem’s WWII Airborne Museum, and join your ship in Nijmegen and visit the lovely forest setting of ‘s-Hertogenbosch to sample decadent Dutch chocolate desserts. You may alternatively visit a fruit and flower farm to meet with the miller there to hear the history of a 15th-century windmill. A carriage ride takes you through the nearby nature reserve to watch for herons, storks, birds of prey, and wild horses. If you prefer, take a guided bike ride along the Rhine River banks of Arnhem. In Maastricht, choose a sightseeing tour of the old cobblestoned university town, or visit a working mill to make your own Limburg pie.